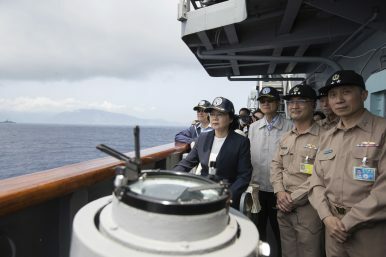 In this Friday, April 13, 2018, file photo released by Military News Agency, Taiwan's President Tsai Ing-wen, second from left, inspects on a Kidd-class destroyer during a navy exercise off the northeastern port of Su'ao in Yilan County, Taiwan. Tsai boarded a navy destroyer to review military drills ahead of planned war games by rival China. Simultaneously, 2019 will likely see an intensification of the war in Afghanistan, amid ongoing peace negotiations and the suggested withdrawal of 7,000 U.S. troops from the country; the presidential election scheduled for the spring may be postponed. Other areas our readers should watch include: a possible uptick in violence in Jammu and Kashmir as a result of the 2019 Indian general elections (especially in combination with large-scale, ostensibly Pakistani-sponsored terror attacks, which might compel Indian Prime Minister Narendra Modi to retaliate more forcefully in 2019 than in a non-election year), the usual chance of South Asian border disputes getting out of control, and increased naval competition between India, China, and Pakistan in the Indian Ocean. Naval competition is especially noteworthy as all three states are in the process of fielding, or already have deployed, nuclear-armed submarines. Overall, 2019 will see a general diffusion of military capabilities in the Indo-Pacific region without any single state being capable of dominating the region militarily. While China will remain the region’s top military power, it qualitatively still cannot compete with the much smaller South Korean and Japanese militaries, let alone U.S. forces. In turn, the United States is no longer capable of militarily dominating the region as it had during the 1990s and 2000s. Consequently, an uneasy balance of power is expected to prevail in the region. First, should North Korea continue to refrain from further testing of nuclear weapons or long-range missiles, 2019 will most likely be dominated by summit diplomacy with North Korean leader Kim Jong Un possibly parlaying face-to-face with Russia’s Vladimir Putin, Japan’s Shinzo Abe, South Korea’s Moon Jae-in, and the United States’ Donald Trump. Conversely, a major known unknown will be the reaction of the U.S. president once it will become clearer in 2019 that Pyongyang will not relinquish its nuclear deterrent. Second, while the United States, along with its regional allies and partners, will continue to carry out freedom of navigation operations (FONOP) challenging excessive maritime claims in the South China Sea that will draw the ire of Beijing, the Association of Southeast Asian Nations (ASEAN) and China are expected to complete the first draft of a South China Sea Code of Conduct in 2019. Following a steady Chinese military buildup in the contested waters over the past years, an uneasy military stalemate will likely continue to hold throughout the next 12 months. Third, after tensions between China and Japan in the East China Sea spiked in 2012, last year saw a number of Chinese intrusions into Japan’s contiguous marine zone. Yet, the past 14 months have nevertheless seen a marked diffusion of bilateral tensions — a trend expected to continue into 2019. Both countries will push on with the implementation of East China Sea crisis management and communication mechanisms, officially agreed to in December 2017. Chinese President Xi Jinping will also make his first official visit to Japan in June 2019. Fourth, while China has stepped up its military pressure on Taiwan throughout 2018, including long-range bomber patrols and naval exercises in close vicinity to the island (the People’s Liberation Army openly seeks readiness to invade Taiwan by 2020), a cold peace between Taipei and Beijing is likely to prevail throughout 2019. Nonetheless, the Taiwan Travel Act, a U.S. law enacted to revitalize reciprocal visits between the U.S. and Taiwan by high-level government officials and signed into law in 2018, as well as a $1 billion U.S. arms package for Taiwan, is bound to increase tensions throughout 2019. First, India is expected to induct its most advanced nuclear-capable intercontinental ballistic missile (ICBM), the Agni-V, to date in the first quarter of 2019. With its increased range and accuracy, the introduction of this new weapon system could pose a problem for long-term strategic stability in Asia. India is also expected to conduct its first real nuclear deterrence patrol in 2019. Long term strategic stability could be further undermined by Pakistani efforts to field a submarine-launched cruise missile (the Babur-3) and a medium-range ballistic missile fitted with multiple independently targetable re-entry vehicles, or MIRVs. Second, China will continue to produce units composed of one of the region’s most advanced long-range air defense system, the Russian-made S-400 Triumf (NATO reporting name: SA-21 Growler) into service, which will significantly boost the People’s Liberation Army anti-access capabilities, especially around Taiwan. (Taipei, meanwhile, will continue its development of an indigenous submarine force as well as push for the sale of F-35Bs.) China’s first domestically designed and built aircraft carrier, the Type 002 (CV-17), could also enter service as early as the fourth quarter of 2019 further boosting China’s blue water navy capabilities. Notably, the next 12 months may also witness the first operational deployment of a hypersonic glide vehicle (HGV), the DF-17, with significant implications for strategic relations in Asia. Third, Russia is back as a major military power in the Asia-Pacific. In 2019, the Russian Eastern Military District — the military arm responsible for operations across the Pacific — is expected to receive more than 6,240 pieces of new and upgraded military equipment. 2019 will likely see the delivery of the nuclear-powered ballistic missile submarine Knyaz Vladimir, the Russian Navy’s first upgraded Project 955A Borei II-class boomer, to the Pacific Fleet. Russia’s Strategic Missile Forces are also slated to receive their first HGV in 2019. Additionally, the first batch of Sukhoi Su-57 fighter aircraft, Russia’s first indigenously designed and built fifth-generation stealth fighter jet, is expected to be be delivered to the Russian Air Force in late 2019. Finally, Russia is expected to commission its largest nuclear-powered icebreaker in 2019, whose primary mission will be to clear passages for ship traffic on the Northern Sea route, which runs along the Russian Arctic coast from the Kara Sea to the Bering Strait. Fourth, the air forces of Australia, Japan, and South Korea will also continue to induct their fleets of F-35A Lightning II Joint Strike Fighters in 2019. These aircraft will primarily serve as platforms for long-range air-to-surface/air-to-air standoff missiles. The Diplomat readers should pay special attention to these weapons systems as they will be an important factor in determining the military balance in East Asia and beyond. Other noteworthy developments to keep an eye on in 2019 are bilateral drills involving Japan’s recently stood up Amphibious Rapid Deployment Brigade, South Korea’s continuous development of its Kill-Chain pre-emptive strike capabilities, and Australia’s SEA 1000 Future Submarine Program. Another important development to follow will be Japanese deliberations over the procurement of vertical or short takeoffs and vertical landings F-35Bs and to convert the Izumo-class of helicopter destroyers into full-fledged aircraft carriers to accommodate the new aircraft. Additionally, readers should pay special attention to Vietnam’s defense deals in 2019. Russia and Vietnam are in final talks over the purchase of 24 Su-35S “Flanker-E” multirole fighter jets — assumed to be delivered in two batches of 12 — with details of the contract reportedly finalized during the visit of Russian Defense Minister Sergei Shoigu to Hanoi in January 2018. Negotiations over the acquisition of two S-400 Triumf batteries are purportedly also at an advanced stage. The United States is expected to maintain a similar force posture in the Asia-Pacific as in 2018 with no major changes save for the deployment of an additional three-ship amphibious ready group (ARG) into the region. Additionally, the U.S. will maintain its continuous bomber presence mission as well as its only forward-deployed Nimitz-class supercarrier, along with no significant increase or decrease of U.S. ground forces in the Asia-Pacific region. Notably, however, the U.S. could quietly begin negotiating with Japan and South Korea over the deployment of future U.S. ground-launched ballistic and cruise missiles on their territories following the termination of the INF treaty, which could make 2019 a particular eventful year for nuclear diplomacy in Asia. 2019 will also likely see the first deployment since 2017 of a Littoral Combat Ship to the region. While next year will not see a Rim of the Pacific Exercise (RIMPAC), and scaled down Foal Eagle and Key Resolve exercises, The Diplomat readers should follow the first ever tri-services joint exercises between India and the United States in 2019, the first ASEAN-U.S. Maritime Exercise, as well as the annual iterations of the Russia-China “Peace Mission” and “Joint Sea” military drills. Interestingly, the 23rd rendition of the Malabar naval exercise, involving aircraft and ships from Indian Navy, the U.S. Navy, and the Japan Maritime Self Defense Force, is expected to take place in Japanese waters for the first time in 2019. Notably, the absence of a single dominating regional military power in combination with the proliferation of advanced military capabilities in the Asia-Pacific region increases the chances of miscalculation when it comes to assessing the costs and benefits of limited war. The Asia-Pacific region will remain the most militarized region in the world in 2019. The three largest defense budgets in the world are in countries with significant military assets in the region: the United States, China, and Russia. This should not distract from the optimistic outlook that 2019 will likely see a reduced risk for military confrontation. The Diplomat readers should, however, keep in mind: Despite our best efforts, the next major military confrontation in the Asia-Pacific, like most military conflicts, will almost certainly come as an apparent surprise and when least expected. Franz-Stefan Gady is a Senior Editor with the The Diplomat and Senior Fellow with the East West Institute. He tweets @hoanssolo. U.S. freedom of navigation operations could take the U.S.-China relationship past a point of no return.